With a lyrical concept based on the cycle of seasons, Galar return with De Gjenlevende, their third album, which was recorded mainly at the (underestimated) Conclave & Earshot Studio with Bjørnar E. Nilsen (think: Taake, Vulture Industries, Dead To This World, Helheim, Byfrost and many more). Still based on the duo M. Kristiansen (harsh vocals, guitars and bass) and A.B. Lauritzen (piano, clean vocals and bassoon), and with assistance of session drummer Phobos of Aeternus-fame (also: Gorgoroth, Trollberg, Gravdal, Malsain etc. 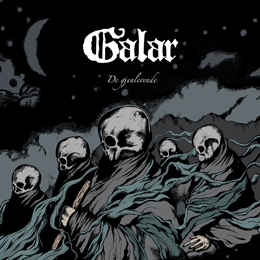 ), Galar present six lengthy tracks (with exception of one instrumental interlude) of genre-trespassing (Black) Metal. At the one hand, this material is based on traditional themes and structures (making undersigned happy), and indeed comparisons to Taake or Helheim aren’t that crazy. Then again, the influence of the modernistic (read: progressive) trend penetrates this material as well, with Vintersorg or Borknagar caressing my grey cells as well. There is quite some variation in each single track, going for both atmosphere and speed; but globally seen, the very same structures go for each single composition on De Gjenlevende. It is, at the same time, a surplus (cohesion and coherence, you see…) and a disadvantage, and quite a difficult effort to go through.